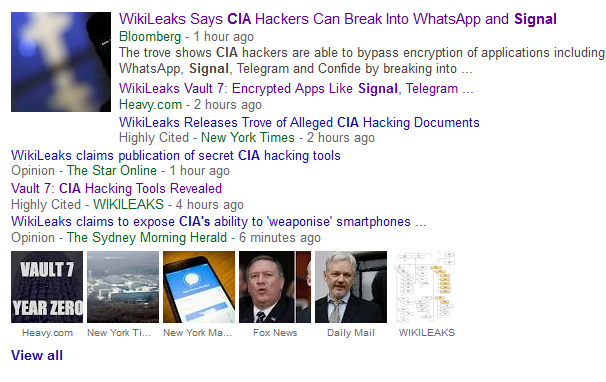 These techniques permit the CIA to bypass the encryption of WhatsApp, Signal, Telegram, Wiebo, Confide and Cloackman by hacking the "smart" phones that they run on and collecting audio and message traffic before encryption is applied. But the details don't seem to show that those apps are compromised, so much as that Android and iOS devices are compromised. It's always been true that if someone can get into your phone, the encryption scheme you use doesn't matter, because they can just pull keystrokes or grab data before you encrypt it -- in the same way that someone looking over your shoulder can read your messages as well. That's not a fault of the encryption or the app, but of the environment in which you're using the app itself. And that should really be the bigger concern here. Over the years, nearly all of the focus on hacking mobile phones has been on the NSA and its capabilities, rather than the CIA. But it's now clear that the CIA has its own operations, akin to the NSA's hacking operations (kinda makes you wonder why we need that overlap). Except that the CIA's hacking team seems almost entirely unconcerned with following the federal government's rules on letting private companies know about vulnerabilities they've discovered. Remember, the Obama White House put in place what it called a Vulnerabilities Equities Program in which the intelligence community is supposed to default to letting private companies know about vulnerabilities. And, yes, this was always something of a joke as there was a giant loophole involving "except for a clear national security or law enforcement need" that the NSA basically used to withhold vulnerabilities all the time. Still, at least the NSA appeared to get around to revealing some vulnerabilities eventually (probably once they were no longer useful). The CIA reports show the USG developing vulnerabilities in US products, then intentionally keeping the holes open. Reckless beyond words. This is why the whole conversation about mandating backdoors and "going dark" was so dangerous in the first place. Those were plans to force even more of these vulnerabilities into the wild, just for the very very rare cases where they were needed by law enforcement or intelligence. At a time when the President is suddenly acting as if he's concerned about domestic surveillance (at least of himself), perhaps now would be a good time to crack down on this kind of stuff. I'm not holding my breath -- but, for now, we're getting a lot more insight into the CIA's electronic surveillance methods, and it sounds like there's more to come. Think of all the possible ways they can get your messages without actually breaking encryption. Yeah. A lot. The paradigm of technology and security needs to change. On Android, when you install a 3rd party keyboard, you'll get a notification about how the developer can intercept what you type (SwiftKey anyone?). When something new is around the corner, security should be paramount, not an afterthought once we realize it's broken. I don't think there is enough black electrical tape in the world for every cell phone and webcam. The rabbit hole goes pretty deep.